Establishing a 21st Century paradigm for audience engagement and career exploration. Decoda is dedicated to sharing our real world knowledge and expertise of life as a musician in this rapidly changing field. Through numerous residencies at universities and conservatories around the world, we engage students through workshops on scripting interactive performances, community service, entrepreneurship, chamber music skills, and by performing side-by-side Decoda/student chamber music concerts. Decoda|Skidmore Chamber Music Institute, 2015 - Festival participants perform Villa-Lobos Woodwind Quartet with faculty member, Alicia Lee. Decoda offers exciting mixed-instrumentation concerts, premiering pieces by the most talented emerging composers, as well as championing the old masterworks. Demonstrating our highly-developed interactive and fundamental performance techniques helps to engage and excite. We also organize side-by-side faculty/student concerts, giving students the opportunity to play with professionals. Decoda brings this unique way of learning to schools around the world. Decoda|Skidmore Chamber Music Institute, 2015 - Interactive performance by DSCMI students for elementary school kids. Performing in community venues is emphasized and incorporated into our curriculum. Decoda organizes and prepares students to perform in nearby senior centers, elementary schools, and/or shelters. They say a performance is worth a 100 hours of practice. These concerts will bring joy to the community, confidence to students, and exposure to the school. Through this work, students also learn how to build relationships with community leaders, helping them to continue this work beyond our residency. Decoda is comprised of world-class chamber musicians with an extensive and diverse repertory; We teach, perform, and inspire excellence globally. We are also adept at coordinating students into groups, appropriately matching levels, and selecting repertoire. 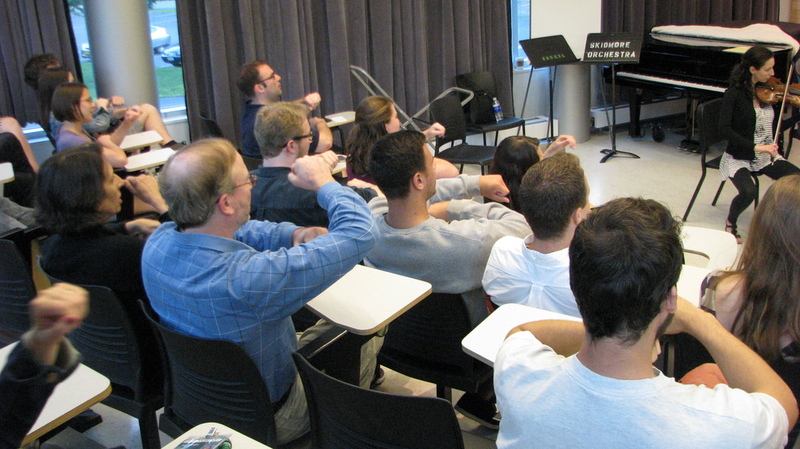 Decoda|Skidmore Chamber Music Institute, 2015 - Students participating in an interactive performance seminar. Decoda offers seminars and workshops on entrepreneurship, speaking from the stage, scripting interactive performances, overcoming performance anxiety, chamber music skills, rhythm, and improvisation. T.Riley's "In C" at NYU - When music meets technology, anyone can make music! Decoda also offers the opportunity to integrate our work with other departments, whether it be dance, theater, math or science. Our collaboration at SUNY Purchase College for example includes a joint project with students from both the Conservatory of Theatre Arts and the Conservatory of Dance, for which a unique choreography of Stravinsky’s “Soldier’s Tale" is created. March 23, 2018 - Decoda presents a workshop on what we call "Interactive Performances"
Oct. 15-16, 2017 - Anna Elashvili visited Peabody Institute to give a talk and masterclass.